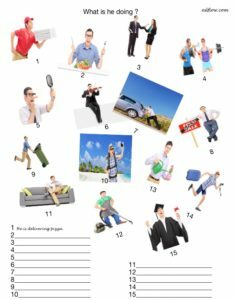 6 Picture-Based Present Continuous Worksheets for Language Students. At a basic level the present continuous or progressive tense is fairly easy to teach. It lends itself to miming activities and exercises using pictures. At a more advanced level it becomes more difficult and students have to understand that some verbs may be used differently depending on the context (ie.stative vs progressive). A worksheet for practicing the present continuous tense for routines. One of the easiest ways to teach the present continuous is with the aid of pictures. Students have to describe the action in the pictures with phrases or sentences. They should feel free to use their imaginations and be creative. Click on the worksheet image or the link to download the PDF file. 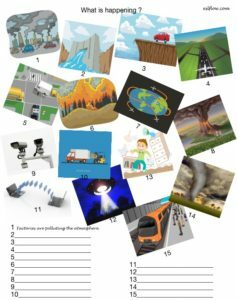 This is an elementary ESL speaking exercise practicing the present continuous tense for general situations. Students make sentences about each picture in the present continuous. This can be done as a speaking or writing activity. 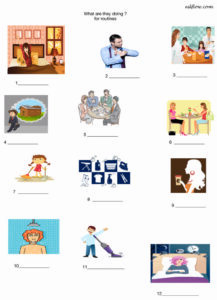 This is an elementary ESL speaking exercise practicing the present continuous tense. Students make sentences about each picture in the present continuous. This can be done as a speaking or writing activity. 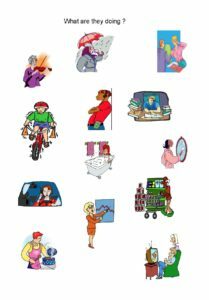 This is a sorting exercise that helps students learn when to use verbs in the present simple or present continuous/progressive tenses. 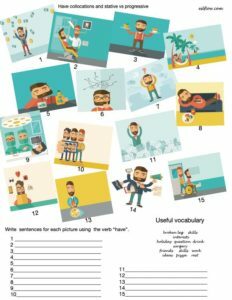 This is a sentence writing exercise to help students understand collocations with “have” and also the stative and progressive uses of “have”. Students are often confused about whether to use the verb “have” in the present simple or present continuous/progressive tense. This exercise aims to clarify that a little bit. This is a more advanced and challenging ESL exercise practicing the present continuous tense for actions and events happening now. 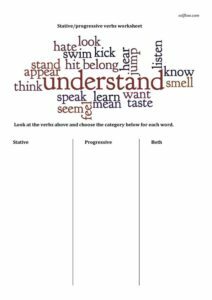 Students need to have a broader knowledge of nouns and verbs to be able to complete this exercise. Students have to describe what is happening in the events and situations depicted in the pictures.